Checklist: How to design a successful support scheme? solrico contributed on overview of incentive schemes worldwide for an Austrian study carried out by AEE Intec on behalf of Austrian Ministry for Transport, Innovation and Technology (bmvit). 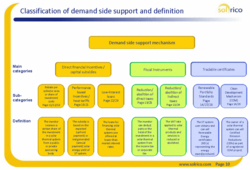 The overview which is based on five years of research for the database of incentive programmes on solarthermalworld.org, lists the pros and cons and explains best practice examples of seven different types of demand-side support schemes: direct capital subsidies, performance-based incentives, low-interest loans, VAT reductions, Renewable Energy Certificates, Clean Development Mechanisms and Energy Service Companies. solrico also developed a checklist - how to design a successful support scheme? The checklist includes three tables (see page 44 to 46): The first slide shows the 12 universally applicable lessons learned, whereas the second one should be applied when programmes aim at private homeowners. The third one includes the points which are important when targeting commercial customers. Download the presentation including the checklist.